"Las Vegas of the East"
Atlantic City is a city in Atlantic County, southeastern New Jersey, United States. Famous for its boardwalk, casino gambling, sandy beaches, spectacular view of the Atlantic Ocean. It is the inspiration for the board game Monopoly, Atlantic City is a resort community located on Absecon Island on the coast of the Atlantic Ocean. In 1921 it hosted the first Miss America Beauty Pageant. The ten-mile long island is separated from the mainland by a narrow strait and several miles of meadows partly covered with water at high tide. According to the 2007 US Census Bureau estimate, the population was 40,517 in the city, and 271,015 in the Atlantic City–Hammonton metropolitan statistical area. Native Lenape inhabited the area prior to the arrival of English settlers in the late 1670s. Jonathan Pitney, a physician, came to the area in the 1820s with the vision of building a health resort. Atlantic City was incorporated on May 1, 1854 by an act of the New Jersey Legislature. Soon after, it became a summer resort area as both developers and vacationers were attracted to its beaches and its proximity to Philadelphia. Atlantic City is located on 8.1-mile long Absecon Island, along with Ventnor City, Margate City and Longport to the southeast. The city has a total area, according to the United States Census Bureau, of 17.4 square miles (44.9 km²), of which, 11.4 square miles (29.4 km²) of it is land and 6.0 square miles (15.5 km²) of it (34.58 percent) is water. Atlantic City has a humid subtropical climate. In the winter, the city does not get as much snowfall as northern New Jersey or inland areas because it is moderated by the ocean. In the summer, Atlantic City gets a sea breeze off the ocean that makes temperatures stay cooler than inland areas. Atlantic City has always been a resort town. Its location in South Jersey, hugging the Atlantic Ocean between marshlands and islands, presented itself as prime real estate for developers. The city was incorporated in 1854, the same year in which train service began, linking this remote parcel of land with Philadelphia. Atlantic City became a popular beach destination because of its proximity to Philadelphia. When it was incorporated, the new city contained portions of Egg Harbor Township and Galloway Township. Atlantic Ocean shore in Atlantic City, New Jersey. The first boardwalk was built in 1870 along a portion of the beach to help hotel owners keep sand out of their lobbies. The idea caught on, and the boardwalk was expanded and modified several times in the following years. The historic length of the boardwalk, before the 1944 hurricane, was about seven miles (11.2 km) and extended from Atlantic City to Longport, through Ventnor and Margate. Today, it is 4.12 miles (6.63 km) long and 60 feet (18 m) wide, reinforced with steel and concrete. 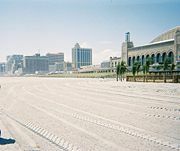 The combined length of the Atlantic City and Ventnor boardwalks—the boardwalk now ends at the Ventnor/Margate border—is approximately 5.75 miles (9.25 km), currently the world's longest. Ocean Pier, the world's first oceanside amusement pier, was built in Atlantic City in 1882. Other famous piers included the Steel Pier, now used as an amusement pier (opened 1898) and the Million Dollar Pier (opened 1906), now the Pier Shops at Caesars. During the early part of the twentieth century, Atlantic City went through a radical building boom. Many of the modest boarding houses that dotted the boardwalk were replaced with large hotels. Two of the city’s most distinctive hotels were the Marlborough-Blenheim Hotel and the Traymore Hotel. In 1903, Josiah White III bought a parcel of land near Ohio Avenue and the boardwalk and built the Queen Anne–style Marlborough House. The hotel was a hit and, in 1905–1906, he chose to expand the hotel and bought another parcel of land next door to his Marlborough House. In an effort to make his new hotel a source of conversation, White hired the architectural firm of Price and McLanahan. The firm decided to make use of reinforced concrete, a new building material. The hotel’s Spanish and Moorish themes, capped off with its signature dome and chimneys, represented a step forward from other hotels that had a classically designed influence. White named the new hotel the Blenheim and merged the two hotels into the Marlborough-Blenheim. Bally's Atlantic City was later constructed close to this location. The Traymore Hotel was located at the corner of Illinois Avenue and the boardwalk. Begun in 1879 as a small boarding house, the hotel grew through a series of uncoordinated expansions. By 1914, the hotel’s owner, Daniel White, taking a hint from the Marlborough-Blenheim, commissioned the firm of Price and McLanahan to build an even bigger hotel. Sixteen stories high, the tan brick and gold-capped hotel would become one of the city’s best-known landmarks. The hotel made use of ocean-facing hotel rooms by jutting its wings farther from the main portion of the hotel along Pacific Avenue. 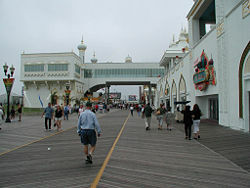 One by one, additional large hotels were constructed along the boardwalk. The Quaker-owned Chalfonte House and Haddon Hall, opened in the 1890s, would by the twenties merge into the Chalfonte-Haddon Hall Hotel and become the city's largest hotel with nearly one thousand rooms. By 1930, the Claridge, the city's last large hotel before the casinos, opened its doors. The 400-room Claridge was built by a partnership that included renowned Philadelphia contractor John McShain. At 24 stories, it would become known as the "Skyscraper by the Sea." The city hosted the 1964 Democratic National Convention, which nominated Lyndon B. Johnson for president and Hubert Humphrey as vice president. The convention and the press coverage it generated cast a harsh light on Atlantic City, which by then was in the midst of a long period of economic decline. Many felt that the friendship between Johnson and the governor of New Jersey at that time led Atlantic City to host the Convention. The Tropicana from the boardwalk. Like many older East Coast cities after World War II, Atlantic City became plagued with poverty, crime, and disinvestment by the middle class in the mid to late twentieth century. The neighborhood known as the "Inlet" became particularly impoverished. The reasons for the resort's decline were multilayered. The automobile became available to many Americans after the war. Atlantic City had initially relied upon visitors coming by train and staying for several weeks. The car would allow people to come and go as they pleased, and many people would spend only a few days, rather than weeks. Also, the advent of suburbia played a huge role. With many families moving to their own private houses, luxuries such as home air conditioning and swimming pools diminished the necessity for people to flock to the beach during the hot summer. Perhaps the biggest factor in the decline in Atlantic City's popularity came from cheap, fast jet service to other premiere resorts. Places such as Miami Beach and Nassau, Bahamas superseded Atlantic City as favored vacation spots. By the late 1960s, the typical Atlantic City tourist was invariably poor, elderly, or both. Many of the resort's great hotels, which were suffering from embarrassing vacancy rates, were either closed, converted to cheap apartments, or converted to nursing home facilities. Prior to and during the advent of legalized gambling, many of these hotels would be demolished in the 1970s and 1980s. Of all the pre-casino resorts that bordered the boardwalk, only the Claridge, the Dennis (now part of Bally's Park Place), the Ritz Carlton, and the Haddon Hall (now resorts) survive to this day. The steel framework of the old Ambassador Hotel was used for the Tropicana Hotel and Casino, although its distinctive brick facade was removed and replaced with a more modern one. Smaller hotels off the boardwalk also survived. 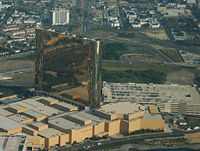 Borgata is Atlantic City's highest grossing casino. In an effort to revitalize the city, New Jersey voters in 1976 approved casino gambling for Atlantic City; this came after a 1974 referendum on legalized gambling failed to pass. The Chalfonte-Haddon Hall Hotel was converted into the Resorts International; it was the first legal casino in the eastern United States when it opened on May 26, 1978. Other casinos were soon added along the Boardwalk and later in the marina district for a total of eleven by 2008. The introduction of gambling did not, however, quickly eliminate the urban problems that plagued Atlantic City. Many have argued that it only served to magnify those problems, as evidenced in the stark contrast between tourism-intensive areas and the adjacent impoverished working-class neighborhoods. In addition, Atlantic City has played second fiddle to Las Vegas, Nevada, as a gambling mecca in the United States, although in the late 1970s and 1980s, when Las Vegas was experiencing a massive drop in tourism due to crime, particularly the Mafia's role, and other economic factors, Atlantic City was favored over Las Vegas. The rise of Mike Tyson in boxing, who held most of his fights in Atlantic City in the 1980s, also boosted Atlantic City's popularity. On July 3, 2003, Atlantic City's newest casino, The Borgata, opened with much success. Another major attraction is the oldest remaining Ripley's Believe It or Not! Odditorium in the world. A 75 percent smoking ban imposed by Atlantic City's City Council went into effect on April 15, 2007, limiting smoking to no more than 25 percent of the casino floor. Casino operators, especially Donald Trump, claim that the ban places Atlantic City casinos at a competitive disadvantage with casinos in neighboring states and is leading to a revenue decline. Atlantic City is home to New Jersey's first wind farm. The Jersey-Atlantic Wind Farm consists of five 1.5 megawatt turbine towers, each almost 400 feet (120 m) high. Gambling halted for the first time since 1978 at 8:00 A.M. on July 5, 2006, during the 2006 New Jersey state government shutdown mandated by the state constitution when the legislature failed to present a budget. The casinos generally remained open for entertainment and hotel services but ceased gambling functions due to the absence of state regulators. The casinos resumed gambling functions at 7:00 P.M. on July 8, 2006. Atlantic City is in the Second Congressional District and is part of New Jersey's 2nd Legislative District. The city is governed under the Faulkner Act (Mayor-Council) system of municipal government. The City Council is the governing body of Atlantic City. Members of Council are elected to serve for a term of four years. There are nine Council members, one from each of six wards and three serving at-large. The City Council exercises the legislative power of the municipality for the purpose of holding Council meetings to introduce ordinances and resolutions to regulate City government. In addition, Council members review budgets submitted by the Mayor; provide for an annual audit of the city’s accounts and financial transactions; organize standing committees and hold public hearings to address important issues which impact Atlantic City. The Atlantic City School District serves students in pre-kindergarten through twelfth grades. Schools in the district (with 2005-2006 enrollment data from the National Center for Education Statistics) are Brighton Avenue School for preschool (72 students), eight K-8 elementary schools— Chelsea Heights School (383), Dr. Martin Luther King Jr. School Complex (613), New Jersey Avenue School (403), New York Avenue School (587), Richmond Avenue School (378), Sovereign Avenue School (792), Texas Avenue School (411) and Uptown School Complex (732)— Atlantic City High School for grades 9-12 (2,574), along with Venice Park School (35) and Viking Academy. Nearby colleges in the area include Atlantic Cape Community College and Richard Stockton College of New Jersey. 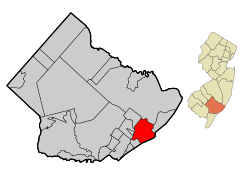 As of the United States 2000 census, the population was 40,517 in the city and 271,015 in the Atlantic City–Hammonton metropolitan statistical area. Other municipalities on the island are Ventnor City, Margate City, and Longport. The census showed there were 15,848 households, and 8,700 families residing in the city. The population density was 3,569.8 people per square mile (1,378.3/km²). There were 20,219 housing units at an average density of 1,781.4/sq mi (687.8/km²). The racial makeup of the city was 44.16 percent black or African American, 26.68 percent white, 0.48 percent Native American, 10.40 percent Asian, 0.06 percent Pacific Islander, 13.76 percent from other races, and 4.47 percent from two or more races. 24.95 percent of the population were Hispanic or Latino of any race. 19.44 percent of the population were non-Hispanic whites. The median income for a household in the city was $26,969, and the median income for a family was $31,997. Males had a median income of $25,471 versus $23,863 for females. The per capita income for the city was $15,402. About 19.1 percent of families and 23.6 percent of the population were below the poverty line, including 29.1 percent of those under age 18 and 18.9 percent of those age 65 or over. 1 Claridge Tower and the Wild West Casino are considered part of Bally's. 2It was announced in December 2008 that the Tropicana Resort will be sold in a bankruptcy court auction at which other companies would have the opportunity to bid above Baltimore-based Cordish Company's $700 million offer. If not, Cordish would get the casino. 3 On May 30, 2008, it was announced that Trump Marina is being sold to Coastal Development LLC and converted into a Margaritaville themed resort. In October 2007 MGM Mirage's board approved the MGM Grand Atlantic City, which will sit on 60 of 72 acres it owns adjacent to Borgata. The project, nicknamed City Center East, would be the biggest and tallest in Atlantic City, featuring three separate towers that will total more than 3000 rooms and suites, each with a different guest experience. In addition, it will feature a 1500-seat theater, a convention center, a spa, a variety of restaurants, nightclub and entertainment opportunities, as well as a 500,000-square-foot (46,000 m²) retail center. It would also have the largest casino floor in the state, with 5000 slot machines, 200 table games, and a poker room. However, the deteriorating economy caused the plans to be put on hold in October 2008. Pinnacle Entertainment purchased the Sands Atlantic City, at the time Atlantic City's smallest casino, and permanently closed it on November 11, 2006. The resort was demolished in a dramatic implosion the following year. The company intended to replace it with a $1.5-2 billion casino resort on 18 contiguous oceanfront acres, which was set to open by 2011, but harsh economic times have caused the company to largely delay construction indefinitely. Morgan Stanley has purchased 20 acres directly north of the Showboat Hotel and Casino and plans to build a $2 billion-plus resort casino. Revel Entertainment Group was named as developer and has broken ground on construction. The resort will feature two hotel towers, Atlantic City's first Vegas-style wedding chapel and more. The property is set to open by 2011. AC Gateway LLC, a development group headed by former Caesars CEO Wallace Barr and former New Jersey Casino Redevelopment Authority Executive Director Curtis Bashaw, is planning to build a $1.5-2 billion casino, hotel, and entertainment complex to be known as Atlantic Beach Resort & Casino. The complex would be constructed on land south of the Atlantic City Hilton that was recently purchased from Hilton's parent company, Colony Capital. The tract includes the site of the former Atlantic City High School and the planned but failed Dunes casino. Only the former Dunes site is presently zoned for casino space. ACJA "Jitney" #29 on a casino shuttle run. Atlantic City is connected to other cities in several ways. New Jersey Transit's Atlantic City Line runs from Philadelphia and several smaller South Jersey communities directly to the Atlantic City Rail Terminal at the Atlantic City Convention Center. Within the city, public transportation is provided by New Jersey Transit along seven routes, and by the Atlantic City Jitney Association (ACJA) on another four fixed-route lines and on shuttles to and from the rail terminal. On June 20, 2006, the board of New Jersey Transit approved a three-year trial of express train service between New York City's Penn Station and the Atlantic City Rail Terminal. The Atlantic City Bus Terminal is the home to local, intrastate and interstate bus companies including New Jersey Transit and Greyhound bus lines. The Greyhound Lucky Streak Express offers service to Atlantic City from New York City, Philadelphia, Baltimore and Washington, D.C..
Access to Atlantic City by car is available via the 44-mile (70 km) Atlantic City Expressway, US 30 (commonly known as the White Horse Pike), and US 40/322 (commonly known as the Black Horse Pike). Atlantic City has an abundance of taxi cabs and a local Jitney providing continuous service to and from the casinos and the rest of the city. 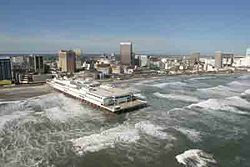 Commercial airlines serve Atlantic City via Atlantic City International Airport, located 9 miles (14 km) northwest of the city. Many travelers also choose to fly into Philadelphia International Airport or Newark Liberty International Airport, where there are wider selections of carriers from which to choose. Several major planned developments in Atlantic City have been put on hold due to the recession in 2008. The City council even lifted its complete ban on smoking after one month in the hope of stimulating hotel and casino revenues for 2009, returning to the former policy of setting aside 25 percent of space in the casinos for smokers. Atlantic City's 11 casinos reported a 7.8 percent decline in November 2008 gaming revenues. Competition from other sites was also cited as a factor in the decline. While organized crime bosses do not control the casinos, their influence is still felt. In 2007, 23 people, some of whom had a connection with the Philadelphia-South Jersey Mafia, were charged with taking part in a high-stakes poker room with underground sports gambling. ↑ 2011 New Jersey Mayors Directory, New Jersey Department of Community Affairs, November 20, 2011. Retrieved January 12, 2012. ↑ Administration, City of Atlantic City. Retrieved June 2, 2011. ↑ Gazetteer of New Jersey Places, United States Census Bureau. Retrieved March 9, 2012. ↑ USGS GNIS: Atlantic City, Geographic Names Information System. Retrieved March 9, 2012. ↑ DP-1 - Profile of General Population and Housing Characteristics: 2010 for Atlantic City city, Atlantic County, New Jersey, United States Census Bureau. Retrieved January 12, 2012. ↑ Table DP-1. Profile of General Demographic Characteristics: 2010 for Atlantic City city, New Jersey Department of Labor and Workforce Development. Retrieved January 12, 2012. ↑ Look Up a ZIP Code for Atlantic City,NJ, United States Postal Service. Retrieved March 9, 2012. ↑ A Cure for the Common Codes: New Jersey, Missouri Census Data Center. Retrieved March 9, 2012. ↑ City of Atlantic City. City Council: General Information Retrieved December 17, 2008. ↑ National Center for Education Statistics. Data for the Atlantic City School District Retrieved December 17, 2008. ↑ Atlantic City Board of Education. Atlantic City Board of Education Listing Retrieved December 17, 2008. Mauger, Edward Arthur. Atlantic City Then and Now. (Then & Now Thunder Bay) Thunder Bay Press, 2008, ISBN 1592238637. National Center for Education Statistics. Data for the Atlantic City School District Retrieved December 17, 2008. History of "Atlantic City, New Jersey"
This page was last modified on 23 April 2016, at 20:51.